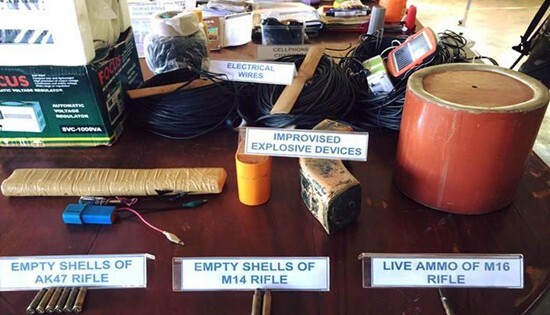 Recovered NPA IEDs and personal belongings by 19th Infantry Battalion from the NPAs during encounter at Brgy Caghalo, Carigara, Leyte on June 18, 2015. CAMP LUKBAN, Catbalogan City, Samar – Soldiers under 19th Infantry Battalion and 43rd Infantry Battalion encountered new people’s army (NPA) members operating in Leyte and Samar Provinces respectively. The encounters both happened on June 18, 2015. 19IB encountered the NPA members in Barangay Caghalo, Carigara, Leyte around 9 o’clock in the morning, while 87IB encountered the NPAs at Barangay Tapol, Paranas, Samar around 2 o’clock in the afternoon. Based from the report of Lt. Col. Nedy C. Espulgar, Commanding Officer of 19IB, his troops were acting on a report of NPAs’ presence at Barangay Caghalo. When they reached the said barangay, the soldiers were fired upon by around 30 NPAs triggering the troops to fire back and engage the rebels for a one (1) hour encounter. This encounter resulted to the seizure of the NPA enclave and the recovery of two (2) improvised explosive devices (IEDs), Electric regulator, Maps, Medical kit, Food Supplies, rebel document and personal belongings. There was no reported casualty on both sides. On the other hand Lt. Col. Seigfred C. Tubalado, Commanding Officer of the 43rd Infantry Battalion reported that while his troops were on combat operation and passing by Barangay Tapol, they were fired upon by around 15 NPAs that triggered a 15 minutes encounter. This encounter resulted to the wounding of two soldiers, namely: Private First Class Jonjie N. Sanico and Private First Class Diego C. Rebalde. Both soldiers suffered gunshot wounds at their left thighs. The rebels suffered undetermined number of casualties based from the bloodstains seen at their route of withdrawals. The wounded soldiers are now recuperating at Camp Lukban Station Hospital and are in stable condition. The encounters are results of the continuous operations conducted by the 8ID soldiers intended to arrest NPAs possessing IEDs to prevent them planting it along routes frequented by the people. MAKATI CITY – Edukasyon.ph founder Henry Motte-Muñoz has been named by Asia Society as part of the Class of 2015 Asia 21 Young Leaders, the preeminent network of young leaders from across the Asia Pacific, representing the private, public, and non-profit sectors. He is the only Filipino who made it to this year’s batch of leaders. Henry Motte-Muñoz is the founder of Edukasyon.ph, a comprehensive online database of higher education courses and scholarships, which will launch in the Philippines this year. He is also the co-founder of Bantay.PH, a youth-driven good governance initiative in the Philippines. "It's an honor to join the Asia 21 Leaders Programme. I look forward to further developing their causes with the advice and experience of this distinguished alumni community. This opportunity will definitely strengthen our advocacy efforts at Edukasyon.ph and boost our efforts in helping high school students find better schools and careers," said Henry. He was born in Paris to a Filipina mother and a French father, and was raised between Paris, London, and Zurich, and the Philippines. Henry holds a BSc in Economics and Economic History from the London School of Economics and an MBA (with distinction) from the Harvard Business School. He is currently working for Bain Capital, a private equity fund in London, the United Kingdom. He previously worked for Goldman Sach’s Investment Banking Division, also in London. Henry will attend the special 10th anniversary Asia 21 Summit in Hong Kong, December 1-4. The summit will celebrate the achievements of the first decade, explore innovative ways to leverage the Asia 21 network for greater impact, and form special Asia 21 Task Forces to address critical issues facing the region. “I hope this opportunity can also inspire our young leaders and students to search for similar opportunities that can support their organizations and expand their network globally. Education plays a huge role in making these opportunities possible,” Henry added. Asia 21 Young Leaders are selected through a highly competitive process based on outstanding achievements, commitment to public service, and a proven ability to make the world a better place. The 32 young leaders who make up the Asia 21 Class of 2015 represent 22 countries and are divided almost evenly between men and women. Fifty percent work in the private sector, 44 percent in the nonprofit sector, and 6 percent in the public sector. Henry joins a powerful network of Asia 21 alumni - proven leaders from across the region representing a variety of professional backgrounds, who will serve as mentors and potential collaborators. The Asia 21 network includes rising political figures – Senator Paolo Benigno "Bam" Aquino IV (Philippines); Minister of Culture and Primary and Secondary Education Anies Baswedan (Indonesia); Los Angeles Mayor Eric Garcetti (United States); Minister for Youth and Sports Khairy Jamaluddin (Malaysia) – prominent media personalities – NDTV journalist Barkha Dutt (India); Herald Corporation Chairman Ryan Hong (South Korea); Zebra Media Founder and CEO Scarlett Li (China); and Moby Group Chairman Saad Mohseni (Afghanistan) – award-winning journalists and filmmakers – Maziar Bahari (Iran); Nitin Das (India); Sharmeen Obaid-Chinoy (Pakistan) – and private sector leaders – Saratoga Investment Sedaya President Sandiaga Uno (Indonesia); Executive Director at YTL Singapore Pte Ltd. Ruth Yeoh (Malaysia); Inle Princess Resort Managing Director Yin Myo Su (Myanmar); and Head of Asia Capital Markets & Financing at Bank of America Merrill Lynch Soofian Zuberi (Pakistan). QUEZON CITY – A LABOR group denounced what they called an “unrepentant and conscious criminal neglect” of the labor department and the Consunji-owned Semirara Mining Corporation (SMC) for the deaths of nine miners after open pit coal mine in Caluya, Antique collapsed on Friday. It can be recalled that in February 2013, ten SMC employees died when similarly, incessant rains caused a wall in the coal mine to collapse. The coal mining giant and its subcontractors were also found to have violated labor and safety standards then. “Nineteen lives lost in a span of two years and the undeniable resemblance of the consequences behind these mining disasters is conclusive that both the SMC and the Department of Labor and Employment (DOLE) are unrepentant labor safety violators, treating workers as expendable variables to feed their interests,” said Leody De Guzman of the militant Bukluran ng Manggagawang Pilipino (BMP). “Their repeated and wanton disregard of the threat on limbs, lives and impact on the livelihood of the workers due to the expected cessation of its operations despite their earlier infringements demands nothing less but the severest of punishments,” he added. The group has also called for an independent investigation to avoid probable collusion between the labor department and the DMCI. “Despite these work-related fatalities incurred in 2013, the DOLE allowed SMC to resume operations after the “danger has been removed or corrected” and no one was made liable,” De Guzman lamented. Another DMCI subsidiary the DMCI Homes and their subcontractors were also determined two weeks ago to have violated substantial labor and safety standard infringements at the construction site of the controversial Torre de Manila. The militant leader was quick to point the accusing finger at the Department Order (DO) 131-13 or the Labor Law Compliance System (LLCS) which was issued in July 2013. To which he claimed was a “symbolical death warrant that has been systematically implemented against the Filipino working class to pursue profit and investments”. It is believed that a hundred and three workers have been killed and countless injured since its issuance. De Guzman inferred that, “These mounting occupational deaths are a validation of cost of the government’s partiality to bend labor and safety standards to satisfy corporations’ appetite for profit at the expense of limbs, lives and livelihood of workers”. The BMP has repeatedly demanded that not unless immediate and drastic reforms including its junking of the said DO and the abolition of contractualization are inperative to avert another Kentex tragedy from ever happening. “Massive reforms and punitive measures against a repeat offender such as DMCI and the negligent regional labor officials must be the order of the day,” De Guzman asserted. The labor group likewise called out to the relatives of the dead miners to emulate the relatives of the Kentex victims to file the appropriate charges versus the company and the officials of the DOLE. Col. Leoncio Ciruray Jr., Commander, 801st Bde. while giving his message to the members of LGUs and LGAs headed by Daram mayor Lucia Astorga during the declaration of Daram as insurgency-free municipality on July 16, 2015. CATBALOGAN CITY, Samar – Municipalities of Rosario, Northern Samar, Sta. Fe, Leyte and Daram, Samar were declared as insurgency-free on July 13, 15 and 16, 2015 respectively. Municipality of Rosario held the ceremony at the town’s municipal hall, while the other two towns held the ceremonies at their respective municipal gymnasiums. The declaration of Rosario, Northern Samar as insurgency-free was formalized by the signing of Memorandum of Understanding (MOU) between the AFP, represented by Brig. Gen. Herminigildo C. Aquino AFP, Commander, 803rd Infantry Brigade; PNP, represented by PSI Anthony T. Din, Chief of Police Rosario; and Rosario LGU, represented by Hon. Gerardo T. Miranda, Municipal Mayor of Rosario. While the declaration of Sta. Fe, Leyte as insurgency-free was formalized by the signing of Memorandum of Understanding (MOU) between the AFP, represented by Col. Dino A. Dolina, Commander, 802nd Infantry Brigade; PNP, represented by PSupt Erwin Portillo, DPDO, Leyte PPO and Sta. Fe LGU, represented by Hon. Oscar J. Monteza, Mayor of Sta. Fe. 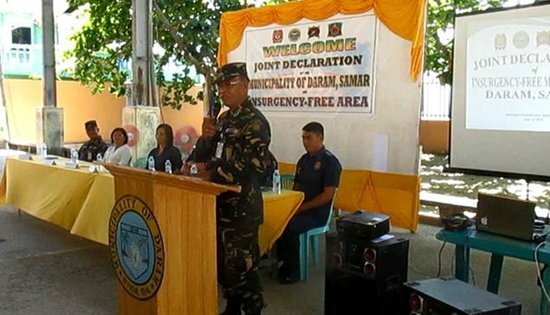 On the other hand, the declaration of Daram, Samar as insurgency-free was formalized with the signing of a Memorandum of Understanding (MOU) between the AFP, represented by Colonel Leoncio A. Cirunay Jr.; the PNP, represented by PSSupt Elmer R. Pelobello, OIC Samar Police Office and Daram LGU, represented by Hon. Lucia L. Astorga, Mayor of Daram. The signings were witnessed by the towns’ municipal council members and their respective constituents. The declarations of the three towns were by virtue of the Municipal Resolutions passed by their respective Municipal Councils. Based on the Municipal Councils’ resolutions, the towns have satisfied the imperatives stipulated in the National Internal Security Plan (NISP) where the threat of CPP-NPA is already relegated to insignificant level. An insurgency free town is a level up of towns declared as Peaceful and Ready for Further Development (PRFD) status. The “Insurgency-Free” status of the three towns, mean they are free from NPA intimidation and extortion activities. Due to these, business activities in the said towns will experience uptrend and will eventually improve their economic and financial status where the people will be the ultimate benefactors. PASAY CITY – Senator Chiz Escudero is informing Malacañang in advance of his plan to require a breakdown of the huge education-related lump sums in the proposed P3.002-trillion national budget for 2016, particularly the funding allocation for the government’s school building project. “I am telling education and budget officials to please break down the school building fund. I am assigning this homework early, so they won’t be caught by surprise,” said Escudero, chairman of the Senate Committee on Finance. The lawmaker described allocations for the construction and repair of classrooms as “traditionally the biggest lump sum” in the budget. He noted that for 2014, P37.7 billion was appropriated for the construction of 43,183 classrooms and P2.85 billion for the repair of 9,502 classrooms. For this year, he said P45.7 billion has been authorized in the national budget for 41,728 new classrooms and 455 technical-vocational workshops. In addition, P2.93 billion has been allocated for the repair of 9,500 classrooms. But despite the huge amount involved, Escudero said these allocations are not accompanied by specific details. “What’s in the budget is just a one-sentence appropriations authority,” he pointed out. According to the senator, the “lack of specifics” could be the reason why the construction of classrooms is facing delays. A review conducted by Escudero’s committee in May and June this year on how these sums were spent revealed a huge backlog. Out of the 43,183 classrooms slated to be constructed last year, only 7,051 have been completed as of May 31, 2015. Worse, not a single classroom has been built out of the 41,728 planned for the year, he said. “Slow implementation could have been averted if we enumerated in the budget preparation phase how many classrooms will be built at what cost and in what schools,” he explained. “Too much time was squandered in the project identification phase. There was too much to-and-fro in validating sites, for example,” Escudero said. “Parang may sign board na. Ikaw na P1 million, papunta ka sa isang school sa Davao. Eh ang nangyari ngayon, instead of hitting the ground running at the start of the fiscal year, saka pa lang maghahanap kung saan itatayo ang classrooms,” Escudero said. Escudero conveyed his demand for lump sum itemization of the classroom fund after the Palace announced that the Department of Education will get the biggest slice of the 2016 budget and the largest funding increase. The DepEd’s budget will go up from P321.1 billion this year to P436.5 billion, or by P115.4 billion. TACLOBAN CITY – Industry leader Petron Corporation today welcomed hundreds of school children to their new classrooms when it inaugurated the Petron School in Tacloban City. This brings to 81 Petron Schools that Petron has built throughout the Philippines since 2002, providing over 160 classrooms to directly benefit 10,000 students. These facilities support the Department of Education’s Adopt-A-School program and contribute much needed venues for education in overcrowded public schools in the country or those that have been severely damaged by major calamities. The Petron School adds two new classrooms in Anibong Elementary School in Tacloban City’s Barangay 68. The typhoon-resilient facility comes complete with chairs and tables for students and teachers, ceiling fans, and a restroom per classroom. Tacloban City officials led by Mayor Alfred S. Romualdez were joined in the simple inauguration ceremony by DepEd Superintendent Dr. Gorgonio Diaz, Jr., School Principal Mrs. Josefina Tanpiengco, PTA President, Barangay 68 Chair Ma Rosario Bactol. The Petron School in Tacloban complements the two-classroom AGAPP Silid Pangarap pre-school in Judge Antonio Montilla Sr. Elementary School also in Tacloban City that was turned over in February. Also as part of its support for the city’s sustainability, the Petron Tacloban Depot adopted a watershed in Barangay 69 and planted an initial batch of 7,500 mangroves. This aims to help protect the community from the impact of tidal waves, storm surges, or even tsunamis. PASAY CITY – Senator Chiz Escudero urged the National Telecommunications Commission (NTC) to immediately rectify the questionable set-up of routing internet data to other countries instead of doing so on the Philippines’ own unified internet exchange point as a simple measure to speed up internet service. “The NTC should start cracking the whip and fix the system immediately. It cannot be ‘business as usual’ anymore. Let’s do away with the mentality of just accepting the present situation and start doing something about it,” Escudero said. The senator said the NTC should start by asking the Philippine Long Distance Telephone Co. (PLDT), the country’s largest telecommunications company, why it continues to refuse to connect to the country’s own internet exchange facility called the Philippine Open Internet Exchange (PHOpenIX) which was developed by the Department of Science and Technology (DOST) primarily to allow a faster exchange of data among users. “PLDT does not want to connect to PHOpenIX. Instead, it connects to the Hong Kong Internet Exchange (HKIX) through its private Vitro Internet Exchange (VIX). I find this questionable because routing data overseas and then terminating here in the country takes a lot longer than routing and terminating data flow within the country,” Escudero said. “Why doesn’t PLDT just connect to PHOpenIX? PLDT is the biggest telco in the country. Its sheer size, and the influence it wields in the information and technology industry, could very well change the IT landscape overnight. But by refusing to connect to PHOpenIX, PLDT is holding the country’s internet world hostage,” he added. “The problem is that government agencies that are supposed to monitor these telcos and help consumers don’t seem to feel the urgency of the situation,” he said. MANILA – Environmental and public health groups expressed frustration and disappointment over the sudden disposal of 29 of the 50 container vans containing mixed wastes that were illegally imported from Canada, despite the absence of a court order directing the illegal shipment’s disposal. "Our fears have been confirmed. For the Aquino government to allow this to happen right under our noses – without proper court order and community consultation- is unthinkable. It is legally, socially, and morally unacceptable to dispose of foreign waste, disguised and declared as non-hazardous, in our very own backyard. This move is a bad precedent and sends a signal to other unscrupulous and illegal waste traders to ship their unwanted trash to the Philippines. It is inconceivable how our own government has carelessly acted without regard to our sovereignty,” said Abigail Aguilar, Toxics Campaigner for Greenpeace Philippines. “The surreptitious transport of these container vans amid this bad weather reeks of bad faith. Indeed, while our collective attention are directed towards disaster risk reduction and management, quietly the BoC slips 29 container vans out of Manila to Clark for disposal knowing fully well that a number of legal actions related to those illegal shipment are pending in Manila RTCs,” said Paeng Lopez, Program Coordinator of GAIA. Last November 2014, a waste assessment and character study (WACS) was conducted by the Department of Environment and Natural Resources (DENR), and witnessed the members of the interagency committee composed of BoC, Department of Health, Department of Foreign Affairs, and a representative of the Canadian Embassy. The WACS revealed that the contents of the sampled containers are heterogenous, or mixed wastes, comprising of household wastes, unrecyclable plastics, broken bottles and electronic wastes. Earlier statements from the DENR said the shipment contains hazardous wastes and must be sent back to Canada in accordance with the Basel Convention on the Control of Transboundary Movement of Hazardous Wastes.